The Mirage G4 is a four-door subcompact sedan designed with a spirit of travel for a very economic cost. It is beautiful outside, with halogen headlights, fog lights, and a high-mounted rear stop light. Color-keyed bumpers and door handles give the exterior an uninterrupted flow of color. Its dark chrome grille accents lead the eye to the chrome alloy wheels and power side-view mirrors. 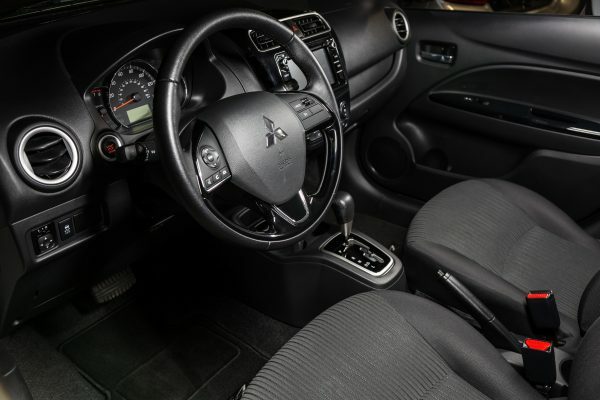 Mitsubishi offers only two models of the four-door Mirage G4: ES and SE. It feels rather sparse compared to the four trim levels of its five-door sibling. The manufacturer’s suggested retail price is an affordable $17,495 for the SE. The Mirage G4 SE is powered by a 1.2-liter MIVEC 3-cylinder engine. Its drivability features electric power steering and MacPherson front strut suspension with stabilizer bar. 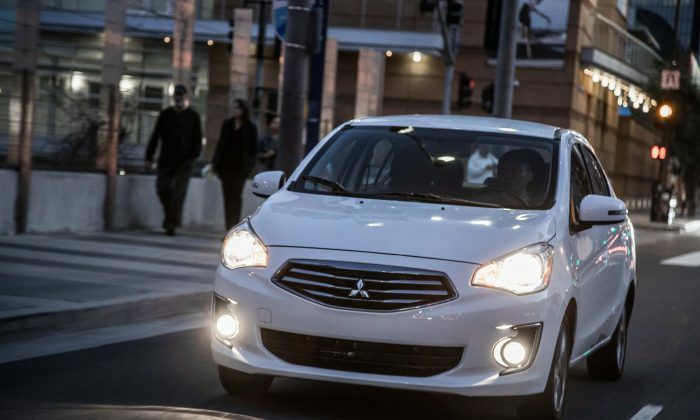 Mitsubishi Mirage delivers 35 mpg in the city and 41 mpg on the highway, for a combined 37 mpg. Admittedly, I would recommend some interior changes. There was little open storage in the front. The two cup holders were not deep enough to hold 12-ounce containers securely. Just to the left and up from the steering wheel was the start button, which is obscured by the steering wheel itself. I would place the starter button on or near the bottom right of the steering wheel on the dash, then make the cup holders wider and deeper. It would also be nice to add storage to the armrest or under the dash. Even though the Mirage SE weighs a lean 2,194 pounds, don’t expect it to participate in the Indy 500. The 3-cylinder engine produces 78 horsepower and 74 lb.-ft. of torque. Nevertheless, the Mirage moved forward smoothly thanks to the continuously variable transmission. The Mirage’s best benefit for me personally was the eco-friendly performance. In fact, with the lightweight, efficient powertrain and streamlined shape, Mirage delivers best fuel economy rating in the class with best CO2 emissions rating. The Mirage comes with a whole array of standard convenience features. Rear-view camera and Bluetooth wireless are standard. The SE model adds a 6.5″ Smartphone Link Display Audio system with Apple CarPlay and Android Auto support. Other standard niceties include cruise control and steering wheel audio controls. Impressive for a subcompact car in this price range. Yet, I would have preferred a larger steering wheel and better wheel adjustability. Both front and back seats were comfortable and not tight-fitting. Foot room and legroom in both front and back were better than adequate. Active Stability Control, Hill Start Assist, and Tire Pressure Monitoring System are just three of the more than a dozen standard safety and security features listed in the car’s literature. The Mirage is easy to park and drive, while using only a few coins to fill up the fuel tank. This little sedan also provides 12.3 cubic feet of trunk space. All these features work together for a pretty good buy. 5 years/60,000 miles New Vehicle Limited Warranty. 7 years/100,000 miles Anti-corrosion Limited Warranty.